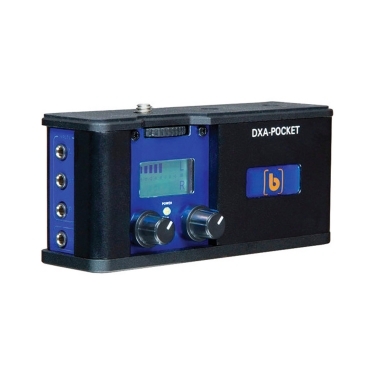 The Beachtek DXA-POCKET is a two-channel, compact audio adapter for camcorders or DSLR cameras. It is ideal for the Blackmagic Pocket Cinema Camera. This adapter is designed to easily attach wireless mics and small, self-powered, camera mounted microphones such as the popular R�DE VideoMics that have unbalanced mini-plug connectors. The DXA-POCKET is very easy to set up and use. The inputs provide for two mono mics or one stereo mic to be easily connected. Exceptionally low-noise preamplifiers provide very clean, wide bandwidth audio for full rich sound. This eliminates the need to rely on the camera preamplifiers as they are rather noisy at high gain. Dual trim controls allow you to adjust the signal levels independently � you can even set two different levels for a mono mic for both channels giving you a backup in case one channel is blown out. The bright, easy to see VU meters make it easy to set the precise recording levels for optimum results. A really cool feature of the rugged extruded aluminum chassis is an integrated mounting shoe which can be used to either attach a wireless receiver or act as a cushioned hand grip with the supplied rubber insert. The handgrip makes hand holding small cameras much more secure and comfortable. The compact size of the adapter fits neatly under or over the camera for flexibility. Also included are two solid aluminum mounting shoes for the camera and adapter to give you plenty of mounting options. The optional BRM-1 Baseplate Accessory adds 15mm rails to allow you to add a matte box, follow focus or other rig accessory to your camera. No other device gives you as many features for great sound and mounting configurations in such a small package as the amazing DXA-POCKET. Get connected today!